This seems to have been a year of duos, or is it that I've been listening to many recently? It is indeed one way of presenting music in a format where musicians cannot hide behind each other, always exposed, forcing them into a performance situation that helps concentrate the mind musically. 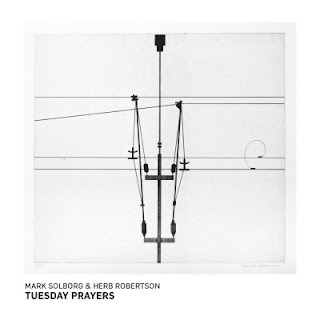 This new record from Solborg and Robertson is one such piece, placing the two musicians in a church in down-town Copenhagen, as the records title says, on a Tuesday night. This is a record where you really feel the two musicians in total synchronicity, any sound or disturbance from outside would have felt like an intrusion. The music the duo produces in this way is highly focused and is indeed like a meditation that could, as the title says, be likened to prayers. Solborg and Robertson don't need much introduction added to that they've also already worked together previously. 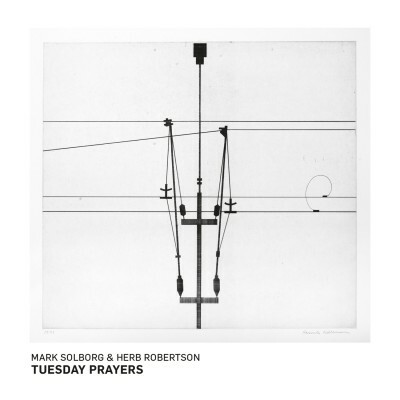 One fine collaboration, reviewed here a few years back, featured Herb Robertson with Evan Parker (The Trees), highlighted Solborg's work with a larger ensemble which produced high quality music that was dense and probing. Here the duo achieve quite the opposite, full of space, this music takes advantage of the peaceful acoustic of the church, creating pure improvised music which relies on the quickness of thought and musicality of each player. This isn't a ground breaking record, or at least there's nothing outrageously new in their playing styles. Robertson and Solborg look for ways to produce music which is melodic, and at times jagged, which often hangs motionless in the air. Solborg's (Frisellian) sustaining chords, textures, or simple melodic lines, help produce the meditative quality mentioned earlier. His playing is gentle and searching, using simple repeated ideas as if looking for a way out of a musical maze. His style is, in my opinion, very much anchored in blues, using dissonance in a melodic way which helps keep the music listenable. His partner, Robertson, brings in subtle ideas built up with an almost childlike simplicity, coaxing Solborg out into the open where the two find common ground. The duo dance around each other, magically leaving just the right amount of space where needed to produce some very magical and delicate musical moments. As for the way the material is presented, the record has an interesting make up of six pieces/tracks, and two sections. Section #1 is titled: PREPARATIONS, made up of two short pieces, followed by section #2, CONCERT with four individual tracks. I imagine that the first two pieces are a sort of rehearsal/sound-check(? ), but this doesn't make any real difference to the playing/presentation as the record works just fine as a one-sitting listening session and is best taken that way. If you'd like to find out more, or interested to pick up a copy, head over to ILK's site. Highly Recommended!